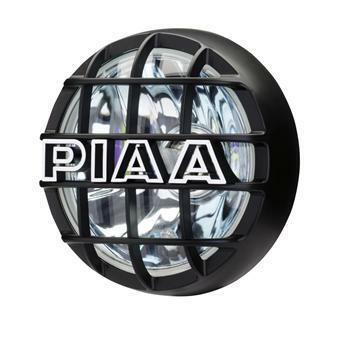 PIAA Lamps - 525 Series - Dezod Motorsports Inc - Home of the automotive performance enthusiast since 2002. The 525’s most intriguing feature is the incorporation of PIAA’s High Intensity LED Technology that creates a glowing effect when the main bulb is switched off. The PIAA 525 Series Dual Beam light uses an H4 twin light system to give your vehicle a clear high beam and plasma ion low beam with blue reflector using SMR (super multi-surface reflector) technology. The unique design also features PIAA’s multi-purpose high intensity LED technology to create a glowing effect when the main bulb is switched off. This light is built with protective black stamped steel housing, a glass lens, and 12V-H4 60/55=110/100 watt twin beam bulb plus 12V white LED. Backed by a limited warranty (bulbs excluded from warranty), and are available as a complete kit OR single lamps. Complete kit includes two lights, pre-assembled wiring harness, relay, switch, and two black grid style covers. Clear high and Plasma Ion Yellow low beam.